Proper cleaning and sanitizing becomes a way of life for most brewers. Without it, you get bad flavors in your beer or worse, an infection forcing the entire batch to be dumped. Family and friends who drink it can get sick as well. What is the difference between cleaning and sanitizing you ask? The way I was taught, cleaners are used for anything visible, such as hop material at the top of a carboy or a tube filled with gunk, and sanitizer is for everything contacting your beer that you CAN'T see. Using a good sanitizer will reduce the population of bacteria on equipment surfaces to as low as possible. Since there are many products available for both, I'll highlight our favorites below. As is the case with many brewers, our favorite cleaner is a product made by Five Star called PBW, or Powdered Brewery Wash. It is nontoxic, biodegradable and very effective in removing protein soils found on brew kettles, fermenters, conditioning tanks, filters etc. It is also safe on skin as well as soft metals such as stainless steel, aluminum, and on plastic and glass. This makes it perfect for soaking blowoff tubes and carboys or anything else where biological crud exists (meaning it was living at some point). Remember that cleaners like this need to be rinsed thoroughly with warm water (I usually rinse twice). The general rule is sanitize everything that touches the beer post-boil. This includes the inside of carboys and bottles, hoses, air locks, funnels, stoppers, siphons and everything else in your brewery. If you have taps, those lines need to be cleaned and sanitized periodically as well. A DIY line cleaner makes this much less of a chore. 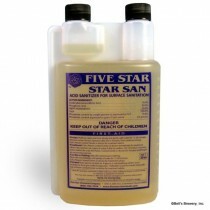 Our favorite is Star San which is a flavorless, odorless, no-rinse food grade sanitizer that is also made by Five Star. When used according to directions, Star San eliminates all microorganisms that it contacts in only a few minutes. It has a nice foaming action that penetrates small crevices and hard to reach places and it leaves behind a film that will continue to protect your bottles and equipment even after they have dried. This residue will not affect the quality, flavor, clarity or color of your beer. Another benefit is that it does not discolor plastics like many other sanitizers. You also don't need to rinse Star San even though you may still see foam clinging to surfaces. As the add says, or maybe it's just us homebrewers, "Don't fear the foam!" The only downside I've seen is cost because Star San is the most expensive (per ounce) of any that are readily available to brewers. There is good news, however, as it can be used again and again if kept in a clean, sealed container. I have one final comment about both cleaning and sanitizing. There is a tendency to slack off on these things once you have brewed a few good beers. My advice is to get these processes down so they are second nature.